And it was stressed no end that the Philippines had “no choice” because it was one of three remaining states in the world which had less than 12 years of pre-university education. Together with Djibouti and Angola, we were the only ones sticking with 10 years of primary and secondary education. “A student can obtain Certificates of Competency (COC) or a National Certificate Level I (NC I) after Grade 10 and a National Certificate Level II (NC II) after finishing a Technical-Vocational-Livelihood track in Grade 12, provided he/she passes the competency-based assessment of the Technical Education and Skills Development Authority (TESDA). NC I and NC II improves employability of graduates in fields like Agriculture, Electronics, and Trade which provides students an option for entrepreneurship, employment, or further education,” the primer adds. Saying that anyone is “life-ready” is way above the pay grade of even the DepEd secretary, but to say SHS graduates are job-ready is simply a scam. Willingness to hire is one thing, but readiness to do so is another. JobStreet estimates 800,000 K-to-12 graduates. They will be competing with up to 600,000 college graduates. Can our backward import-dependent, export-oriented economy absorb all of them? 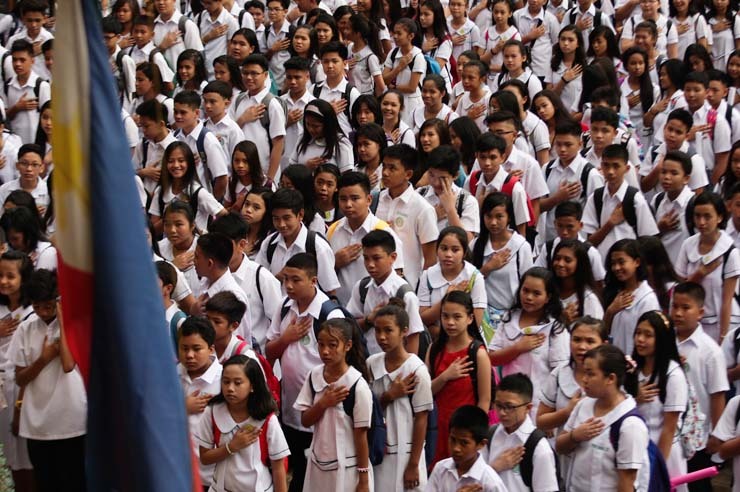 In fact, the DepEd’s arrogant proclamation that ‘the first batch of Grade 12 learners are about to become full-fledged contributors to social development and nation-building” immediately got torpedoed by employers. The Philippine Chamber of Commerce and Industry, the voice of Big Business and the comprador class, went on to proclaim: “We won’t hire them”. Asked for further comment, the PCCI demanded more SHS hours for “on-the-job training” and “internship” — which ACT Teachers Partylist Rep. Antonio Tinio correctly pointed out was a demand for large-scale slavery of students. The PCCI seems to want to use the K-to-12 as a means to obtain workers who would work without wages, with no prospect of permanent, gainful employment. Congress should look into this, for the sake of the K-to-12 system they helped put in place and to assess whether the billions of taxpayer money for K-to-12 indeed attained the desired results. More importantly, they should ask students, teachers and parents for their take on the issue that has marred their lives for the past few years. Both Congress and DepEd cannot be tone-deaf to the complaints of students, teachers, and parents regarding K-to-12. They basically did what they were told, and yet the promised outcome may not be attainable. The K-to-12 is not a simple government project. It has profound effects on the lives of students, teachers, and parents who have had to directly contend with the changes ordered from up high the DepEd hierarchy. The mad scramble to produce good results for the first batch of K-to-12 graduates may have come at a great emotional, financial and other costs to “stakeholders” whose voices have not been given a fair hearing. Worse, they are being told to shut up. DepEd was so proud of state assistance to private schools by the voucher system, which netted capitalist educators billions in taxpayer money that they have used to expand their operations. But whether DepEd provided similar direct assistance to students facing the brunt of K-to-12 changes, the pressure they are put in to attain new academic objectives, we do not know. Whether teachers are equipped with the academic training and adequate material assistance in order to pursue those objectives, the DepEd is silent. Whether parents have been able to earn and save money for two years of additional high school education of their kids — the cost of education is about more than tuition; there’s the rising costs of food, utilities, transportation, etc. — the DepEd seems to not care. Teachers for one are complaining about the crush of new, additional administrative and other non-academic tasks in connection with the new K-to-12. And yet when they raise their demand for salary increases, the DepEd secretary goes bonkers with rage about the supposed financial ignorance of underpaid, overworked mentors. The last thing we would like to hear from defenders of the system and the K-to-12 is to tell students, teachers, and parents that this is all about personal responsibility. Personal responsibility ends where national obligation begins. K-to-12 is a national program directly affecting millions of students, teachers, and their families. The promise was immediate and full employment, and instant entry to the entrepreneurial sector. It is thus no surprise that our kids are stressed. Our teachers and parents too. That the government, school owners, and employers are not stressed is a clue. They are the sources of the undue, unremitting, and grinding stress. First published in the Manila Bulletin, Nov. 3, 2018 issue. So what if there are Reds in schools?